With autumn now well underway it seems a good time to offer some horticultural updates and perspectives from here in the gardens at Perrycroft. Having closed throughout August, allowing us to fire up machinery and generally make a bit of a mess, September saw us reopen and welcome in the last flurry of visitors before winter’s grip begins to take hold. It is all too tempting to become reflective at this time of year, so easy to become nostalgic as summer slips into our selective memories, but for our small gardening team here in the Malvern Hills there is still much work to do and as one task ends another inevitably begins. This is how we like it, allowing us to become immersed in the garden no matter what the season. We are currently continuing with the hedge clipping. Yew and box are essential to the character of Perrycroft and it takes weeks to work our way around the avenues of green that encase the formal areas of the garden. 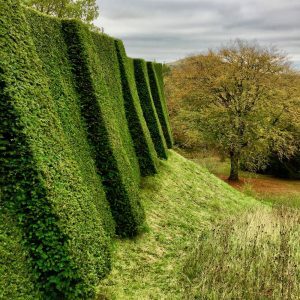 The task in hand requires a keen eye, and makes for satisfying work as slowly and surely the blurred green lines of a season’s growth are brought sharply back into focus. They give a real sense of permanence and maturity to the garden and it is a true seasonal highlight to be stood on the south terrace admiring the great buttress hedge, freshly clipped with its evergreen bones looking all the more mighty against the low autumnal light. Work in the wilder areas of the garden is another ongoing task and since July we have been busy cutting our expanses of wild flower meadow. We began as always with our spring meadows having let the great drifts of the lent lily Narcissus pseudonarcissus fade giving the accompanying foliage enough time to drink in the precious sunshine, of which there was plenty! Although it made for tiresome work, the hot and dry conditions sought to play in our favour by leaving the hay crisp and easy to cut, whilst the process of gathering and removing the felled material was so much quicker on account of it being so light. August came and with it some much needed rain but the cutting has carried on regardless. Most of the work is now done but there are areas still standing. Great swaths of knapweed on the bank to the south of the house have been left to seed out and provide nourishment for feasting finches whilst in other areas generous patches of devils bit scabious are currently giving us some spectacular last gasps of native colour. These areas will soon be cut but for now they are to be enjoyed. 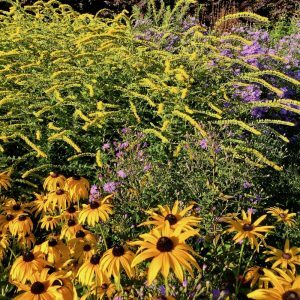 As for the formal areas of the garden it is the time of year when the North American perennials show their true worth. 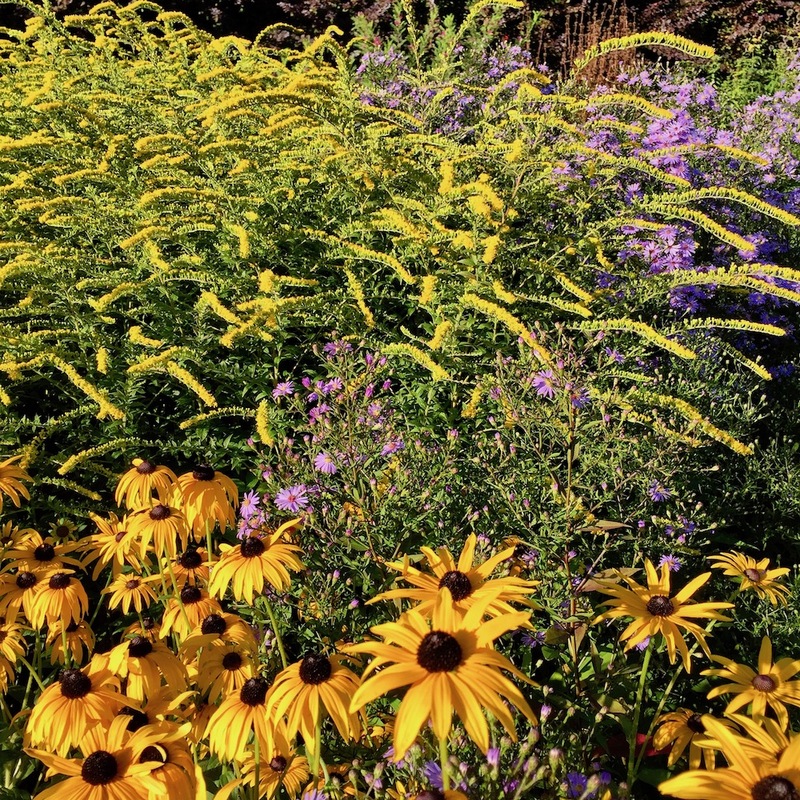 Generous stands of Symphyotrichum ‘Little Carlow’ and Rudbeckia fulgida var. deamii surround vibrant stands of Solidago ‘Fireworks’ with its golden racemes rivalled only for colour by the display in the dahlia border. 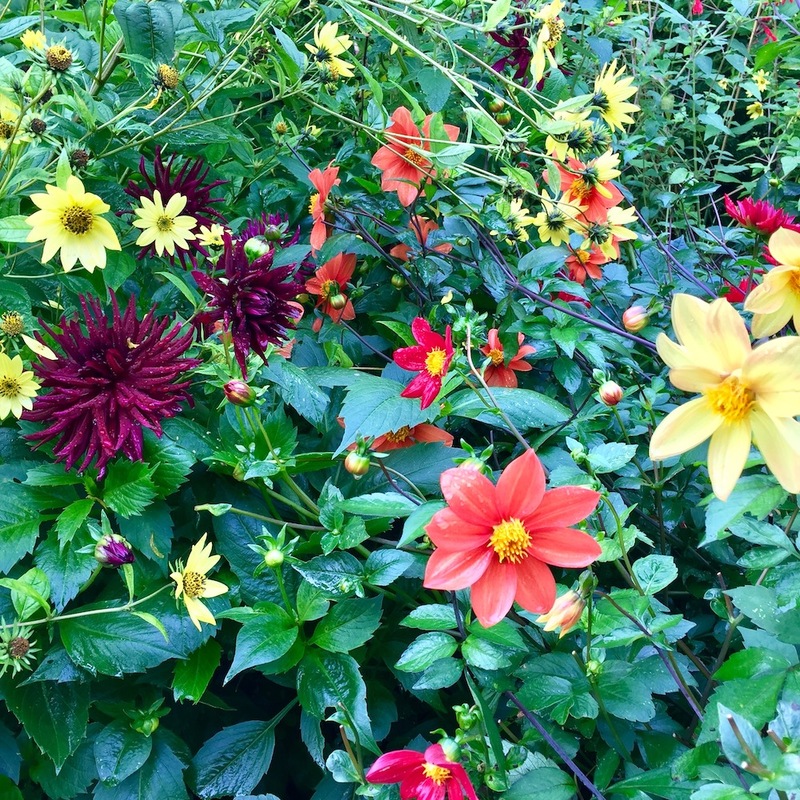 This has looked splendid throughout September and October, and the exotic tones of colour add a real zing to the garden until the first frosts. We are pleased to see them doing so well having been left in the ground to brave a torrid winter and then being baked in the hard clay during the summer drought. They are indeed shorter than last year but this does mean less staking is involved! Elsewhere the signs of autumn show themselves throughout the garden. Vitus coignetiae is ablaze around the west and south walls of the house whilst the Red oaks, the Persian ironwood, the flowering dogwoods, the cherries and the Liquidambars (to name just a few) have all turned beautifully. Down by the pond a trio of Viburnum plicatums are full with berries and their foliage deep and rich in earthy tones. Nearby, Heptacodium miconioides is in flower and providing delicious scent, whilst up above the native canopy of oak and beach slowly turns to a melancholic yellow. Meanwhile in the herbaceous borders seed heads have developed, their skeletal forms illustrating beauty in the decay as the perennials with less structure begin to collapse under their own weight of abundance. 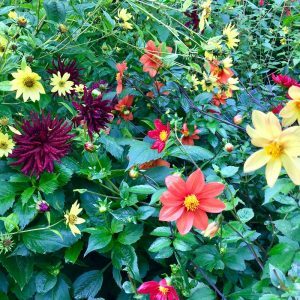 As a gardener it is wonderful to work amongst such changes and I will wait until winter for my reflective tendencies to take hold as for now there is so much to marvel at in what is surely the most magical time of the gardening year.